On An Overgrown Path: Why let the facts get in the way of a good industry myth? Why let the facts get in the way of a good industry myth? 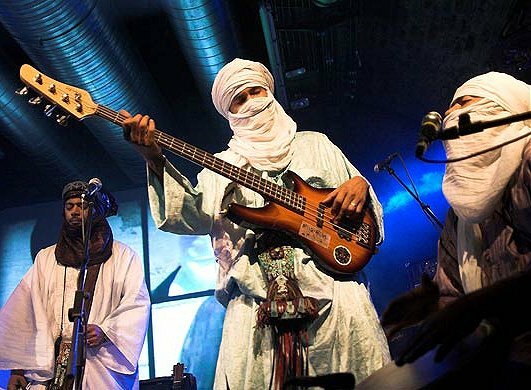 From Gaddafi guerrillas to Grammy winners and on to, of all places, the Suffolk town of Bury St Edmunds – that is the career of trending Tuareg blues band Tinariwen who are seen above. Before their concert in the medieval market town yesterday I went in to a branch of Waterstones, the only multiple retailer left in the UK with any pretensions of being a serious bookseller. Large retailers use unit sales data from electronic point of sales systems to allocate display space in their stores - unlike classical music industry executives who base their repertoire decisions on industry myths about a lucrative mass market. In the Bury branch of Waterstones the section for books about ‘Religions, Beliefs & Spirituality’ occupies twelve metres of display space, while ‘Classical Music’ titles occupy less than one metre - which must say something about the relative appeal of the esoteric and the exoteric. Bury St Edmunds is just 38 miles from Aldeburgh, and it is not the first time this week I have asked why let the facts get in the way of a good industry myth?.